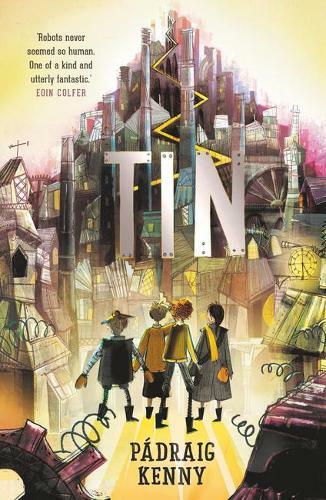 A science fiction fairy tale, set in a astonishingly realised mechanical world, Tin is a heart-stopping adventure about friendship, courage and finding your identity. Imagine: the world you know is gone, in its place, a machinarium of Mechanicals, intelligent machines created with the sole purpose of serving mankind. The laws governing their creation are strict and above all the merging of human and mechanical is strictly forbidden. Christopher is 'Proper': a real boy with a real soul, orphaned in a fire, he can remember nothing of his old life but vague images of his mother and father, cloaked in smoke and ash. Now he works for an peculiar engineer, a maker of the eccentric, loyal and totally individual mechanicals who are Christopher's best friends; his only friends. What follows is a remarkable adventure, as Christopher discovers who he really is, and what it might mean to truly be human.